Not knowing how much weight is pushing on your vehicle’s towball when towing is risky business. It’s all too easy to exceed the maximum towball download rating and not know it, and every trip can be different in terms of what you’re loading into the van and what it weighs. The cheapest way of tackling this is to use your bathroom scales – just slide the scales under the coupling and use two pieces of timber, with one placed across the top of the scales to spread the mass (so as to not damage them) and another fitted vertically between the scales and the coupling. The negatives are that unless you know that your caravan’s ball weight is likely to be low, the bathroom scales won’t read the ball weight other than to tell you it weighs off the scale (of about 130kg, roughly the limit of most bathroom scales). Also, the newer glass bathroom scales are more easily broken unless you’re really careful, and the old faithful steel scales you’ve had for years – and have relied on to lie about your weight – will faithfully underestimate your caravan’s ball weight too. There are dedicated trailer ball weight scales available for less than $100 and one would be a good investment. 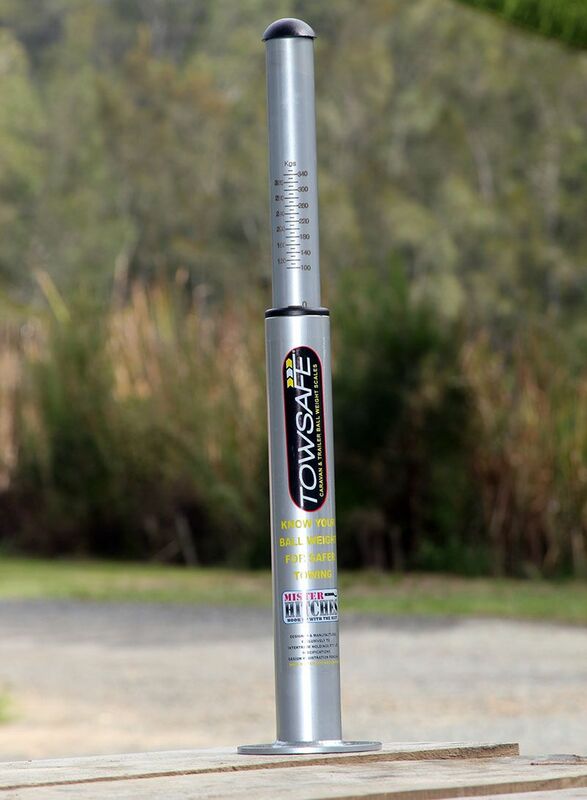 Most measure ball weight between 100kg and 300kg, so won’t do if your caravan is on the very limit of the typical 3500kg/350kg maximum allowed weights of the heavy-duty tow vehicles. You need to have a level surface to park your van on and ideally it would be smooth concrete, bitumen or brickwork. Not all of us are lucky enough to have easy access to such a surface so if it’s coarse bluechip or grass, then you’ll need a piece of thick timber to support the scales. Make sure the park brake is on and that wheels are chocked. With the timber in place under the coupling and the scales sitting on it, simply raise the caravan on the jockey wheel until you estimate that the piece of timber and scales will be able to slide under. Then check that the scales are level on the ground (or timber) so that when you raise the van the scales do not fall over. Then lower the van’s coupling very carefully onto the scales using the jockey wheel, until the jockey wheel is raised clear of the ground. Do not take the jockey wheel off the van or swivel it up – if the scales do tip over, you’ll want the jockey wheel there to stop the van landing on the A-frame. 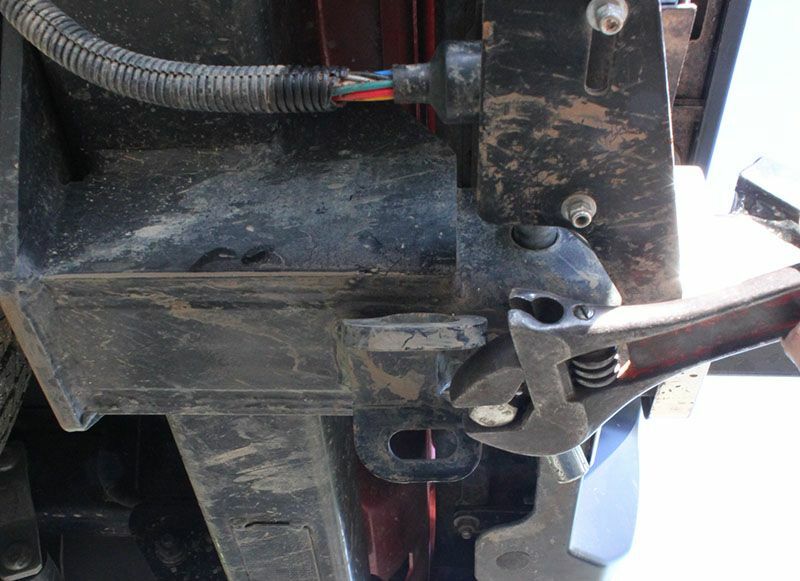 Most vehicles’ trailer hitch receivers have a bolt under the hitch that threads into the hitch assembly and stops the tongue from rattling when towing. The thing is, such an anti-rattle bolt is not meant to stay tensioned against the tongue when you’ve hitched up. It’s possible that the tongue might crack at the point it’s pushing against the tip of the bolt. It’s a two-minute job to release the bolt tension off the tongue (not forgetting to nip-up the locking nut once you’re done so the bolt doesn’t unthread itself entirely). Of course, the bolt will need to be slackened off if you’re replacing your towing tongue with another weight distribution hitch tongue anyway – just don’t re-tension it with the new tongue in place. The reversing camera is a great invention, especially if you’re towing. It takes the frustration out of hitching up your van when you’re by yourself. In most hitching-up circumstances you can retire your spotter if you have one, probably to everyone’s relief! If you’re buying a new tow rig, plenty now come with a rear-view camera as standard. If not, there are many available on the after-market for not much money. You really want one with as wide an angle as possible, angled so you get the towball in the picture. Even though you can do without a spotter, you still need to be aware of your surroundings and not focus solely on the camera display. For example, in tight locations it’s all to easy to forget that by applying a heap of lock as you reverse you might actually be turning the front of the vehicle into an obstacle. Keeping the camera lense clean is also vital. Philip Lord is a tech head from way back, having written for Australia’s most prestigious motoring and RV magazines for many years. He’s also owned and restored caravans from the 1980s and ’90s. I am confused about the anti-rattle bolt. If it is there to stop vibration when towing why loosen it once the caravan is attached, as then the tongue can rattle? It looks to easy , and besides my wife will not lend her scales to me ,so the other option to to purchase one of those measure down load scales. My big concern is at the moment is trying to overcome the problem of grey water storage. I didnt comprehend what the hell you are talking about with the rattle bolt and had the same question as person above??? ?